Yes, it’s true. The forthcoming IPCC Special Report on Global Warming of 1.5C has been formally accused of ‘pulling its punches’ in order to let polluters off the hook by none other than Bob Ward, policy wonk at the Grantham Institute. The Graun, of course, has the story. OMG, they left out the really bad bits! The tail end high risk scenarios beloved of climate catastrophists the world over. The highly implausible but theoretically possible scenarios which alarmists have for years relied upon to drive their regressive energy and transport policies like a sustainable coach and horses through legislative obstacles. Warnings about the dangers that 1.5–2C temperature rises could trigger irreversible loss of the Greenland ice sheet and raise sea levels by 1–2 metres over the next two centuries. But . . . . muh climate refugees and climate change wars, muh Gulf Stream collapse, muh disappearing Greenland and and muh Deluge! ‘Science’ says all this can happen with another half degree temperature rise! To add to the amusement, the author seems to think that melting sea-ice (frozen salt water) will contribute to a slowing of the Gulf Stream, when it is in fact melting fresh water from Greenland glaciers which could conceivably dilute salty Arctic waters sufficiently to slow down the North Atlantic thermohaline circulation. No. The IPCC has a rigorous review process, as it should do. This inevitably results in some changes. The examples given are still in the main report, where there is room for discussion of the uncertainties and nuances, they are just not in the summary. Indeed no. There will inevitably be sentences that are cut from previous drafts of the SPM and as @markpmcc says they remain in the main report. @IPCC_CH authors don't water down findings to placate governments. Real qn is: will governments accept findings of science at plenary? Bob’s looking pretty stupid and out on a limb here. Nothing much new then. Tags: 1.5C Warming, Climate Change Policy, climate hysteria, IPCC, Journalism. Bookmark the permalink. Disputed. The OTT high risk scenarios are _lies_. Authors cherry pick from uncertain data and less certain science to get those high risk scenarios. There’s no conscience guiding them to pick actually possible scenarios. Not their own, not their critics’ conscience. They’re motivated to raise awareness. Their high risk scenarios are not “theoretically possible”. Mark, I was perhaps being a little generous, but working on the assumption that, where systemic uncertainties are very large, theory allows for highly implausible scenarios. For example, it is theoretically possible that if Greenland melted quite suddenly over a relatively brief period of several decades or a century, the freshwater influx to the North Atlantic could very seriously disrupt the Atlantic Meridional Overturning Circulation or even shut it down completely. It’s likely happened before in the early Holocene. The ‘Hothouse Earth’ scenario is a theoretical possibility (according to currently accepted theory), but is extremely implausible, reliant as it is upon high climate sensitivity to CO2, coupled with a cascade of very uncertain positive feedbacks. A synonym for “alarmist” is “deceitful” as the term has come to be played out in the real world of climate alarmism. Richard Betts is very cross with Bob. Reviewer of IPCC report breaks confidentiality agreement by discussing drafts with the media before report is finalised. So you're not denying that you talked to the press about the content of the drafts that you obtained as a reviewer? This is too funny. Notice that Bob dropped himself in it. This is false. I am not a reviewer of the FGD drafts. Bob, the first paragraph of the article says "according to reviewers who have studied earlier versions of the report and its summary." The entire story isn therefore based on comments about the earlier drafts. Was there another source? NB in my earlier tweet I didn't name you. Oh dear, it does rather look like Bob is busy digging himself an even deeper hole. ‘re last para Sea ice is fresh water even when made from salt water. The N.a. and. Cl ions are excluded from the ice matrix. It has always been hard to understand the intransigence of the climate establishment. In the case of Bob, it may simply be that he is dim. Did you use your knowledge of earlier drafts to say it is "being altered" and reveal what had been "cut"? Somebody obviously did. So are you saying it wasn't you? In that respect, he always surprises. Bob is annoying all the right people. This research is rigorously gounded in science but it is vital that confidence in future outcomes is not overstated. Like all science, climate research involves uncertainty. It’s a tragedy of our times that scientific honesty is taken to out of context by some. Alarmoholics know most people haven’t got the stamina or even interest to plough through the whole report, so if it’s not in the summary it’s not reaching much of the audience. Re. earlier IPCC reports it’s been claimed that parts of the summary were more alarmist than the main report, so this sounds like a small step in the right direction. Ben, that is one very bizarre conversation. Ward admits to being a reviewer of earlier drafts. He denies being a reviewer of the FGD, but that is entirely beside the point, as the FGD has been leaked. Bob saw earlier drafts as a reviewer. He has obviously seen the final draft and it is obviously him who is saying that things which were in the earlier drafts have been left out of the final draft. So he has broken the confidentiality agreement which he must have signed as a reviewer of earlier drafts.by talking about their content now in relation to the final draft. Bang to rights Bob, I’m afraid. 1. New sea-ice contains significant amounts of salt. 2. The salt leaches out as the years go by so multi-year ice is largely free of salt. 3. The salt budget of the northern oceans is overall unaffected by the freezing and melting of sea-ice. 4. Melting of even the oldest (decades old), thickest sea-ice, with the subsequent release of freshwater into the ocean is unlikely to affect the stability of the AMOC. 5. A massive release of ancient freshwater from the Greenland ice sheets will probably affect AMOC. Since the summary report is going to be (science) fiction again, does this “news” really matter? Ward is a known w@nker, have we really learned anything new about him? Do we really believe the final draft will be watered down so as not to upset Saudi or the USA? Has it ever been before? Dissension in the ranks? This might be the only real news. Alan, I think the significant things are, as raised in the thread about fabricated news and the Global Commission report, and as per your point about dissension, it seems to be the case that alarmists are increasingly having to fall back on speculative hypotheses such as attribution to make their claims. Ward is as you describe him. And he’s a fool. But he also knows what Stern et al expect, and his job is to marshal the press accordingly, and it looks like they are going to be disappointed by the report. A familiar trope of alarmists is to claim that IPCC reports are ‘too conservative’. This pops up at the end of one of the threads, in which a green investor takes issue with Betts. It took me ~30 seconds to search “IPCC” & “underestimate” & find articles arguing that reports are regularly watered down. Your word is nice, but it doesn’t erase historical conservative bias, which is a public disservice, which isn’t what reports are for. Don’t die on that hill. It was also the claim of Lewandowsky/Oreskes et al, who claimed that IPCC scientists had been contaminated by the deniers’ “pause meme”. Ben do you mean that Stern et al. or the marshalled press will be disappointed by the report? I suspect both might be. Betts certainly hasn’t made Bob’s herding task any easier. Them pesky scientists are getting more and more like cats each report cycle – soon they’ll be talking natural variation and be out of control. Thought the USA was pulling out of “the Paris agreement” ? Well, that’s a welcome change, if true. The AR5 review process was a sham. Appeasing the enemies of mankind never makes sense, even if they are called the US, Saudi Arabia and Australia. I think Richard may reflect on whether the SPM accurately reflects the risks described in the underlying chapters. He seems remarkably unconcerned about this and more interested in shooting the messenger. But I thought the science was settled. How can there be such disagreement between the scientists? And I thought the IPCC reports were about science, not politics. How come it’s all suddenly so political? If Bob disagrees with the latest IPCC summary, does that mean he’s a denier? children stop believing in Santa Claus. Bob Ward’s Santa, Sir Grantham, has made it clear that Bob’ s income very much depends on how vigorously Bob defends climate extremism and silences those who are insufficiently extremist. It occurred to me that maybe Bob himself was behind Grantham’s tweets, in which case “idiots” (plural) would be incorrect, but apparently the tweets come from someone called Merlin Sibley. Their twitter home page claims “Rigour and Independence”, LOL. Santa Claus is a climate change denier of the worst sort. He gives naughty children fossil fuel (coal) instead of toys. Wow. Bob is really doubling down on the pathological-lack-of-self-awareness. Richard appears to have appointed himself to police any discussion of the report's content before publication. Nevertheless, the quotes from the report in the newspaper article are accurate. The Guardian is so desperate to prove that ‘climate refugees’ are a reality that it is inventing them. Jaime. One of those so-called “climate refugees” comes from Isle de Jean Charles. It and other similar islands from Louisiana are textbook examples of what happens to the sediment laid down by a distributary once the delta switches. With no water bringing new sediment, the sediment pile begins to subside and is attacked by the sea. The result is the drowning of the delta lobe with remnants preserved as narrow barrier islands. These are continuously attacked by the waves and eventually disappear (without any sealevel change necessary). The Louisiana islands are not, repeat not victims of climate change, but of natural subsidence and wave attack. Everyone knows this, it’s in all physical geography textbooks. Indeed. Thanks Alan. The island apparently sank 3ft during the 20th Century and sea level rose . . . . 6.5 inches! But people fleeing the encroaching sea are still “climate refugees”. The deliberate deception is both breathtaking and appalling. Climate alarmists make snake oil salesmen look like respectable entrepreneurs. but see Dana at the G likes – New study reconciles a dispute about how fast global warming will happen. “I find it curious that ‘contrarian’ climate scientists come up with low end warming after they have declared their scepticism. Perhaps they had a gut feeling and it was bourn out by further study. To be fair, Otto (legit mainstream climate scientist) was a lead author on one such study (Lewis was a co-author). The energy balance model approach is a valid way of trying to figure out climate sensitivity. It just turns out to have some flaws that bias its results, or at least make it a transient (short-term) estimate rather than equilibrium (long-term) estimate. Basically, Lewis stumbled onto an approach that happened to be biased in his preferred direction. I alos find it curious that contrarian scientists [and alarmist ones] throw out the basis of the scientific method- that is you cannot pick and choose which evidence you want and what you don’t want. The real issue for the IPCC here is to balance what can be promoted as consensus “science” and the need to give political credence to climate mitigation policies to constrain warming to a given temperature rise. The more realistic scenario is upper one, with emissions only peaking in 2030. The aggregate impact of all the emissions pledges within the Paris Agreement will not stop emissions rising through to 2030. Yet this requires negative emissions from around 2070. 1.5°C of warming has about 630 GtCO2 of net emissions by the end of the century from 2011. With around 35 GtCO2 of emissions per annum, that it greater than 700 GtCO2 of extra emissions by 2030. 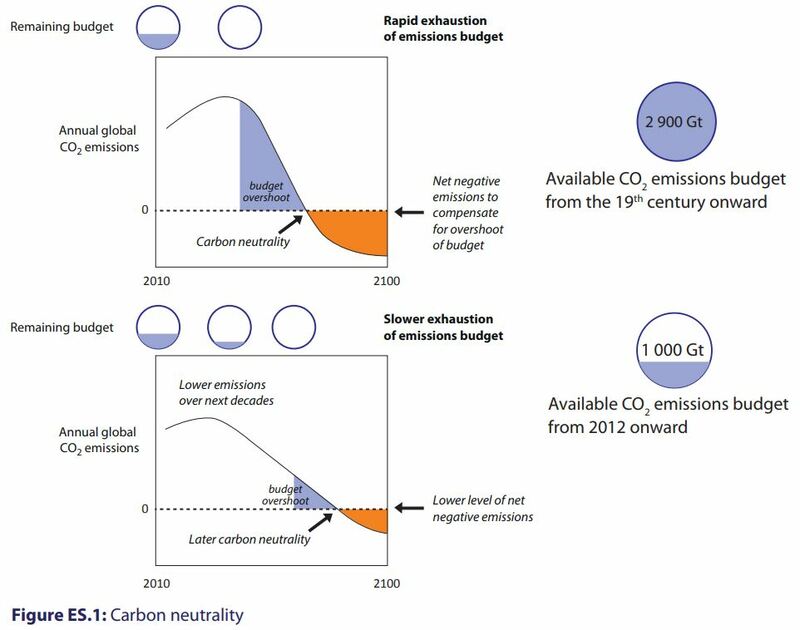 So to prevent 1.5°C of aggregate negative emissions must be significantly greater than the positive emissions post 2030. This is contingent on assumptions which are collectively untenable. What Nutticelli fails to mention is that Goodwin’s study itself relies upon an energy balance approach! Oops, Bob’s really gone and done it now. He’s accused IPCC scientists of being fossil fuel shills! I’ve paged Lew to ask if he will be doing a new study on this new breed of climate alarmist ideational conspiracist science deniers. Richard is visibly now very irritated by him and probably speaks for many other scientists. Bob has blown it. He has few friends now on either side of the debate. As a non user of social media I miss the finer points ( and sometimes the massifs) of current controversies. Is anyone rash enough to support Bob? Or is he a lone Don Quixote tilting at IPPC windmills? I do so hope it’s the latter. “Anyone” above does not include grown men who claim to be scientists with insight into the most urgent issue that mankind has ever faced, but who assume the identity of a rabbit that refers to itself in the third person. Ha, Jaime thinks Eli gives Leporids a bad name; Jaime thinks Eli is more Rodent. Jaime blocked Eli a year ago for trolling! Okay, So we are all agreed then, from the Bob to the anti-Bob. The IPCC is not fit for purpose. BS has joined the rabbit and the end-is-nigh merchant, and declared himself a Retwardian. I'll make it simple. Copies of versions of the SPM showing the exact changes @ret_ward said were made have been publicly available for months. There was no basis for you saying Ward leaked anything or for you to repeatedly say the SPM did not undergo the changes he described. I’m sure Brandon’s intervention on Twitter has absolutely nothing whatsoever to do with his grievance with Ben and with Cliscep for ‘banning’ him and the fact that this Cliscep article, critical of Ward and broadly supportive of Betts, is doing the rounds, having gained the attention of the GWPF. I’m sure it’s just his famous nose sniffing out something ‘not quite right’ in the way Bob has been universally chastised by the scientists whose credibility and personal integrity he so publicly brought into question. I’m sure I can’t hear the sound of a grinding axe. Far from being luke warm, I expect the “scientific findings” to be geared to embarrassing my friend President Trump and persuade the sheeple to vote socialist because its worse than we thought. In a way, Bob Ward is right. This report was commissioned by the UNFCCC in the Adoption of the Paris Agreement paper on 12 December 2015. Specifically it was in Paragraphs 17 and 21, reproduced below. Paragraph 17 states the failure of the Paris Agreement. Through to 2030 emissions will still be climbing, yet the 2C of warming pathway required a 25% emissions reduction. As true climate alarmists they thought that if they could get a gaggle some of the world’s leading scientists to produce some scary scenarios. There turned out to be two problems with this. By looking at the impacts of an incremental in average global temperature increase going forward that is similar to the increase in the last forty years there is not a lot to go on. Paul’s article “The Myth of the Climate Crisis” published today looks at Roger Pielke Jnr’s revised book that finds no real evidence of an emerging problem, so it is pretty difficult to claim a further 1.5C will somehow be a tipping point. Second, the idea of emissions reductions will be a pretty hard sell for two groups of countries. There are the “developing” countries. I put this in italics as it is a pretty diverse group of countries, with 80%+ of the global population and about 65% of GHG emissions. After China has shown, and India is showing, that high levels of economic growth are at least partly achieved by rapid development of cheap fossil fuels, other countries want a bit of the action. Then there are the economies deeply dependent on exporting of fossil fuels. The United States might be now the largest producer of fossil fuels, but Russia and Saudi Arabia are not far behind. But in nominal GDP the US economy is about 12 times that of Russia and 28 times that of Saudi Arabia. Other highly dependent countries are Kuwait, Iran, Iraq & Turkmenistan. For countries in either group to seriously consider abandoning their economic prosperity there has to be some pretty scary and highly credible stories. Even if they swallowed such stories whole, what would be the use in a nation self-harming when the vast majority of the benefits to their nation are from other nations self-harming? Over at BS’s blog, BS is valiantly defending Bob Ward’s honor against Richard Betts’ vicious attacks. I sometimes think Brandon is mad and enjoys arguing with himself. There is just no point at all in writing what he did. I can’t see what he is trying to prove. Ward admitted to being a reviewer of the SOD, but not the FGD, which was apparently ‘leaked’ by persons unknown, therefore seen by Ward. He used his knowledge of what was in the SOD to compare its contents with what was in the leaked FGD to claim that bits had been left out, which he then attributed to a conspiracy on the part of the scientific authors involved. By sharing his knowledge of what was in the SOD with the press, he therefore breached the confidentiality agreement which he must have signed as a reviewer. Therefore Betts’ accusation of impropriety (which did not specifically mention Ward, but realistically could not be construed to apply to anybody else) was accurate. End of story. Move on please Mr Schollenberger, for heaven’s sake.